Whether you have a broken glass, broken LCD, charging problems or your tablet won’t turn on, bring it to us. We are professional and qualified to carry out such repairs to get it fixed up at the earliest.By using the highest quality replacement parts, we make sure that your device will work like new. 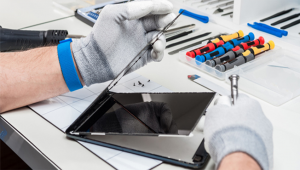 We replace only those parts that are required to be replaced and will not burden you with the cost of repair that your tablet do not need. We work on all leading tablets of different brands.When it comes to the First and Second generation of the iPhone, you have to first take out the SIM tray with a small paperclip. Then remove the screws on both sides of the charging spot and take off the back cover using a little force. Detach the ribbon cable that connects the case to the top.